Lamp brightness is expressed as MSCP (Mean Spherical Candlepower). MSCP is an industry-wide standard of measurement that effectively integrates and averages the brightness of a lamp in all axes. To convert MSCP to lumens, multiply by 12.57 (4 pi). MSCP of a lamp is derived by centering the lamp within an integrating sphere (see below) with an interior diameter of one foot (30,5 cm). The interior of the sphere has a bright-white, matte coating that disperses and reflects the light evenly. 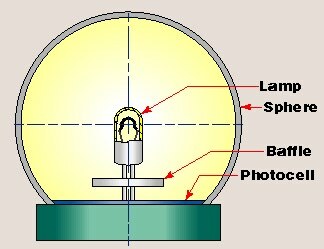 A photocell in the base of the sphere converts the light energy to electrical current, and sends the current to specialized instrumentation for measurement. A baffle mounted below the lamp shields the photocell from direct illumination by the lamp, ensuring measurement of a true average of the light produced by the lamp. Aged & Selected (AS): AS lamps are aged for a minimum of 16 hours and selected for MSCP. A lamp designated AS15 is selected to have an MSCP tolerance of +/- 15 percent.